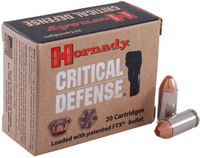 Details: Hornady Critical Defense ammunition eliminates clogging with the use of the patented Flex Tip bullet. Upon entering soft tissue, the tip swells and imparts equal pressure across the entire circumference of the bullet cavity. The result is unrivaled bullet expansion and performance every single time. Shiny silver nickel plating prevents corrosion, and is easily visible in low light situations.